Melissa McCarthy is an American actress, the star of The Boss, Bridesmaids, Identity Thief, Spy, Ghostbusters, and so on. She is the most popular non-format-body actress. According to Forbes, she is included in The World's Most Powerful People. Melissa McCarthy was born in Plainfield, Illinois. Her parents worked as farmers, just like most of their neighbors. Melissa would have probably had the same life, but she revealed a comic talent. As the young woman graduated from a Catholic school for girls, she followed the advice of her cousin, an actress Jenny McCarthy, and went to New York. Melissa began to perform as a stand-up comedian in nightclubs. At the same time, she studied acting at a Manhattan theater studio and went to Los Angeles to join the troop The Groundlings specialized on improvisation comedies. At that time, the actress’s weight exceeded 100 kg. However, the artist’s success proved that a woman did not have to have a model appearance to conquer the world of cinematography. When Melissa McCarthy got famous at the theater, she started receiving movie offers. The actress began with secondary roles. The TV series Jenny starring her cousin Jenny McCarthy became her debut. The episodes in popular movies Charlie's Angels, The Life of David Gale, Disney’s The Kid, White Oleander, and others followed soon. Besides, the actress worked on the independent tragedies The Third Wheel and Pumpkin. When Melissa participated in the popular series Gilmore Girls, her popularity grew immensely. She was playing a chief Sookie St. James for seven years. Initially, Alex Borstein got this role and even appeared in a pilot episode. Still, the movie creators gave the role to McCarthy. The last season of the series came out in 2007. In 2016, the series was renewed. The comedy Samantha Who? is another popular movie starring Melissa. The next project, the psychological drama The Nines, drew attention to the artist. The romantic comedy Bridesmaids turned the unusual actress into a star. Various movie studios gave her offers, and she selected only the projects she was interested in. McCarthy played in the humorous detective The Heat with Sandra Bullock, the crime comedy Identity Thief with Jason Bateman, and the tragicomedy St. Vincent with Bill Murray. In a while, Melissa ventured herself into scriptwriting: she created the plot of the movie Tammy where she also starred. In 2015, the actress took the lead role in the comedy Spy. This is a parody movie mocking plot patterns and stereotypical characters in spy movies including the famous James Bond works. Jason Statham and Jude Law participated in this project: Statham played a typical small-minded meathead, and Law personified a gallant and charming spy. Melissa McCarthy played Susan Cooper who rejected the agent’s position in her youth and became an analyst in the headquarters. Because of the information leakage, Susan becomes the only agent whose face the enemy does not know. McCarthy’s character was original and new; she was nominated for the Golden Globe. Further on, Melissa appeared in the comedies Central Intelligence and The Boss. 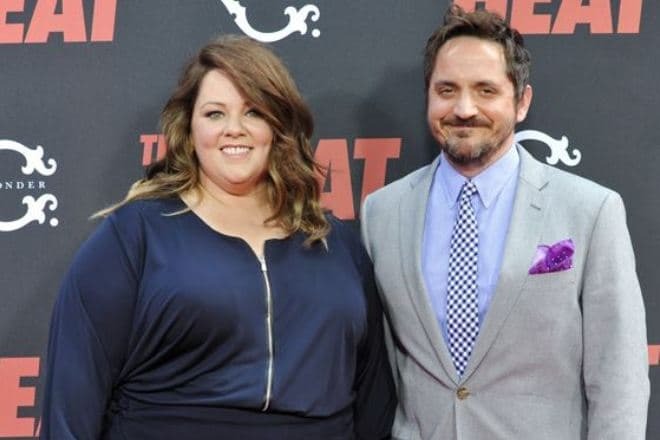 When Melissa McCarthy moved to California and joined The Groundlings, she met a comedy actor Ben Falcone. They started dating and lived in civil marriage for a while. In October 2005, the couple married officially. Two years later, the daughter Vivian was born. It is interesting that McCarthy played a pregnant character in Gilmore Girls at that time. Thus, the actress did not let down her producers and directors. In spring 2010, the second daughter, Georgette, was born. Both girls have participated in movies with their mother. Besides, Melissa tried herself as a fashion designer and created fashionable clothes for plus-sized women. 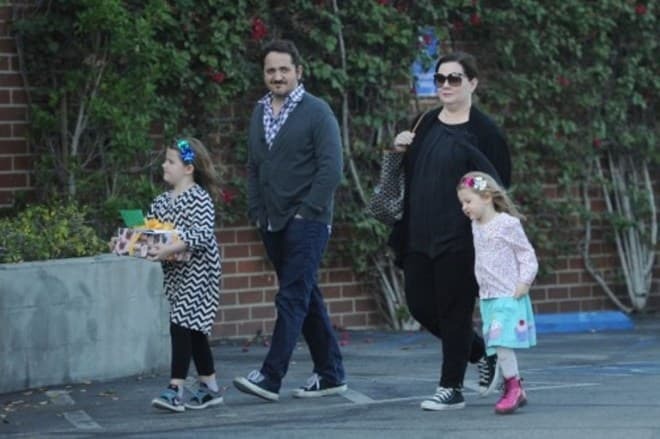 Melissa McCarthy understands they want to be beautiful and stylish and presents new models based on her own experience. The actress does not feel terrible because of her excess pounds. She often becomes a top ten highest-paid actresses of Hollywood while other model girls are left behind. However, Melissa tries to stay in shape. In 2016, McCarthy lost 30 kg. While her weight was 107 kg. (with the height 157 cm.) 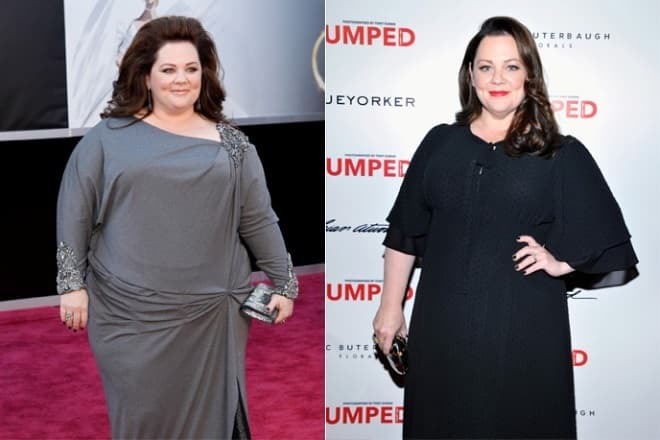 during the shooting of Mike & Molly, by the moment she began to work on Ghostbusters, Melissa lost much weight and did not stop improving herself after that. The actress admits that she has to face negative reactions to her appearance, particularly, her weight. Haters criticized the woman when Melissa refused to lose weight and felt satisfied by her body and also when she decided to get rid of some kilograms. As the artist added, there was so much rancor in those remarks that she felt discouraged. 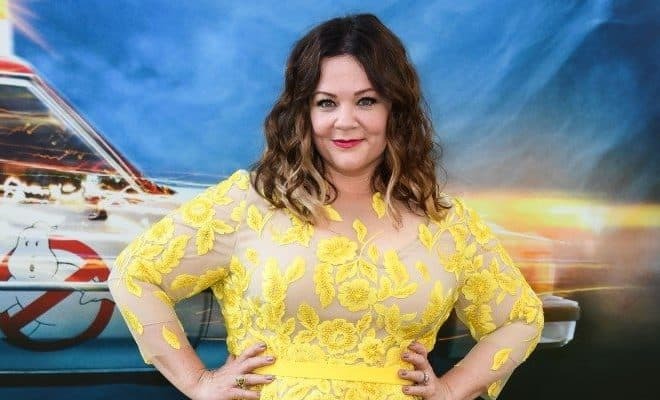 However, Melissa does not let others dictate her anything: McCarthy posts photos in a short robe on her Instagram page, wears bright dresses, and does not hesitate to joke about her weight in movies. In 2016, the remake of the fantasy action movie Ghostbusters came out. McCarthy played the lead role of Dr. Abigail Yates, a writer and a scientist, who published a book on ghosts. The woman devoted her life to studying paranormal activities; eventually, she founded her own agency and got regular orders. Even before the premiere, the movie reviews were ambiguous. Some people accused the creators of insulting the original; other critics welcomed the project and mentioned the renewed female cast met the audience’s need to see more women. They also emphasized it did not prevent fans of the classic from enjoying original movies and cartoons. In 2017, the movie Life of the Party was announced; Melissa McCarthy played Deanna, the main character.